Politics cast dust on the results. Updated 7/30/2018. This article will look at highest and lowest Martian air pressures reported for Viking 1, Viking 2 and Mars Science Laboratory (MSL) landers and how they compare when normalized to Mars areoid (the equivalent of Martian sea level). All of these landers touched down well below areoid. For Viking 1 the landing altitude was 4,495 meters below areoid. Viking 2 was only 3,637 meters below areoid, while MSL was 4,400 meters below areoid. Vikings 1 and 2 were stationary, but MSL is a rover (Curiosity) which does change altitude, however such changes are not part of the calculation (yet, at least). Table 1 shows the average pressures anticipated at landing altitudes as well as the highest and lowest pressures reported from these sites. The Viking Computer Facility Viking 1 and Viking 2 data source offered something akin to hourly pressues rather than average daily pressures provided by the MSL Rover Environmental Monitoring Station, so average pressures for sols with Viking mission high or low pressures are calculated on Table 2 with results posted also posted in the J column for Table 1. 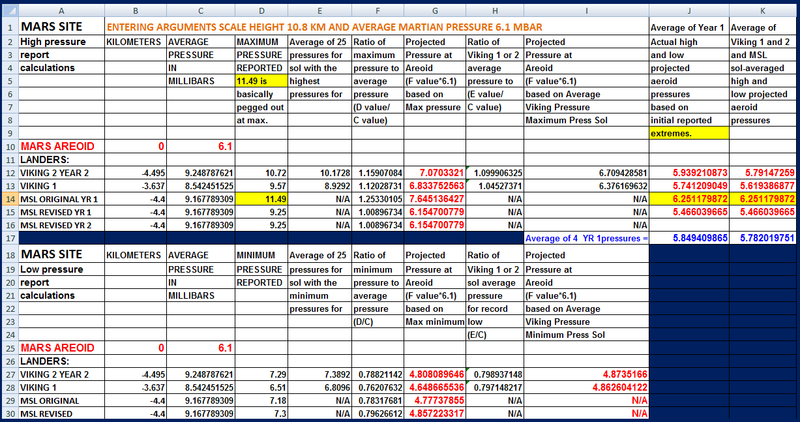 Table 1 above: Average pressure calculations for Viking 1, Viking 2 and MSL based on 6.1 mbar at areoid and a scale height of 10.8. Table 1 shows actual highest and lowest pressures published, as well as what are the averages for essentially hourly pressures for Vikings 1 and 2 for sols with maximum and minimum pressure. 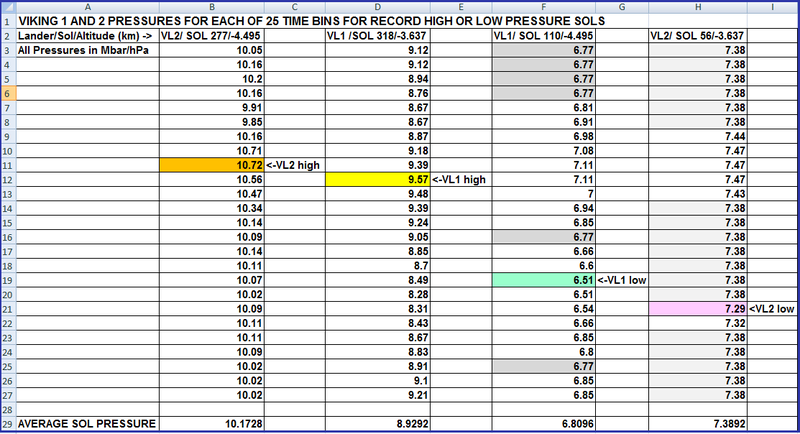 Table 2 below shows the pressures for 25 time bins for Viking sols when maximum or minimum pressures were posted by the Viking Computer Facilty. Average pressure for the same Viking sols are also shown. As of the date of this article we only have sol-averaged pressures for MSL, and a good bit of evidence that shows this data was revised or altered for reasons that are very questionable. But for Vikings 1 and 2 we have pressures that were reported for 25 time bins (about 59 minutes long) for the sols concerned. While we thus have 25 pressures per Viking sol, we wanted to compare "apples with apples" rather than "apples with oranges. To do this we looked at the sols with highest and lowest pressures reported and then calculated what the average pressure was for each of these sols of concern. As mentioned earlier, this is shown on Table 2 above. While this procedure did not necessarily identify the highest or lowest sol-averaged pressure for these landers, the assumption was that it would be close. For Vikings 1 and 2 the highest pressures ever reported were 9.57 (Sol 318.38) and 10.72 mbar/hPa (Sol 277.34) respectively. The sol-averaged pressures for these sols were 8.9292 and 10.1728 respectively. For Vikings 1 and 2 the lowest pressures ever reported were 6.51 (Sol 110.66 and 110.70) and 7.29 mbar/hPa (Sol 56.74) respectively. The sol-averaged pressures for these sols were 6.8096 and 7.392 mbar/hPa respectively, however these figures were clouded by issues of digitization discussed in section 2.6.1 of our Basic Report. Viking surface pressure measurement and resolution were limited by digitization to 0.088 mbar (0.088 mbar = 1 DN (A-D Converter, 8 bits). An audit showed 0.09 mbar was the most common change for VL-2 on its sols 1 to 199. That's fairly obvious on Figure 2 for VL-2 Sol where most pressures are 7.29, 7.38 or 7.47 mbar and only two readings appear to be interpolations (7.32 and 7.44 mbar), but not so obvious for the other three sols shown on Figure 2. 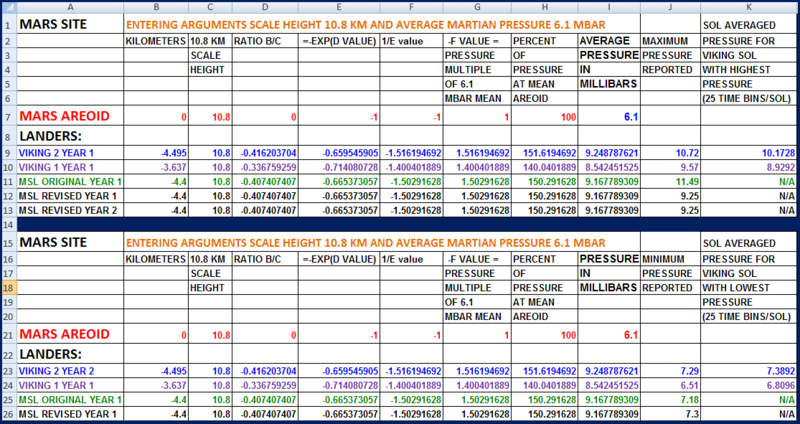 Table 3: Pressure calculations for Mars aeroid based on pressures seen at the VL-1, VL-2 and MSL landers which were all below areoid. RESULTS OF THE NORMALIZATION STUDY. Having stated the above caveats, we use the mean atmospheric pressure surface of 6.1 mbars as a starting point. Using s scale height of 10.8, we move up from the landing latitudes with the high and low pressures reported to areoid to see how the pressures projected there stack up, As is indicated on Table 2, with respect to high pressures reported (and in the case of MSL Sol 370, altered after we pointed out that an 11.49 mbar (1149 Pa – see Figure 1) first reported as an average daily pressure implies that the Vaisala pressure sensor on MSL must have pegged out at its maximum capacity. Their fudged new report is prima fascie evidence for why we think their published data is not trustworthy. So what were the high pressure normalization results? The VL-2 maximum pressure and official maximum pressure ever measured by a lander (10.72 mbar) was seen at Ls 270.930 (early winter at VL-2, but early summer at the Martian South Pole. The VL-1 maximum pressure was seen at Ls 277.724. The same seasons apply. For MSL, which sits slightly south of the Martian equator, there are now two Martian years of what looks to be maximum pressure at 9.25 mbar (925 Pa). These pressures were advertised for Ls 252 to 253 in MSL Year 1 and again at 9.25 mbar at Ls 257 in MSL Year 2. This is late fall in the northern hemisphere, but late spring in the southern hemisphere. The initial advertised maximum pressure for its sol 370 of 11.49 mbar was at Ls 9 = early spring in the northern hemisphere, but early fall in MSL’s southern hemisphere. This pressure was obviously enormously out of place in terms of seasons because “the party line” was that the CO2 ice at the Martian South Pole had to return to a gaseous state to drive up pressures worldwide on Mars. Note how much variation was seen in the above figures, but also note that in the end JPL ensured (at least to this point) that the maximum pressure given, (likely allowed) was exactly the same on both Martian years, 925 Pa (9.25 mbar). It is this lack of variation that first attracted our attention (and suspicion) when examining pressures given for much of the Martian year for the Vikings (especially for Viking 1 - see Figure 2 below). (1) 7.07 mbar for Viking 2 Year 2. (2) 6.83 mbar for Viking 1. (3) 6.15 for both MSL years. (1) 7.64 mbar for MSL Year 1 (but the pressure would have been higher because the 11.49 figure represents a maxed out pressure sensor that was only rated at 11.5 mbar (these ratings tend to be approximate). (2) 7.07 mbar for Viking 2 Year 2. (3) 6.83 mbar for Viking 1. (2) 6.709 mbar for Viking 2 Year 2. (3) 6.376 mbar for Viking 1. (4) 6.15 for MSL Year 2. A caveat for understanding the differences in high pressure seen as that Vikings 1 and 2 were experiencing global dust storms when they measured maximum pressures. However, based on how pressure increased at Luke Air Force Base by 6.6 mbar (see Sections 8 and 9 of our Basic Report and in particular Figure 35), we think that even with gravity that is only 38% of Earth's, a similar storm on Mars should drive up pressures by at least 2.5 mbar, and that big an increase is not shown on Figure 2. Frankly, having seen how many times JPL's REMS Team revised its data, especially after we challenged it, we would recommend placing no confidence in REMS generated pressures. We believe that JPL/REMS Team figures are generated based on political considerations. As an example, from the August, 2012 landing of the Mars Science Laboratory until May, 2013, JPL via the REMS Team and Ashima Research published false information showing an absolutely constant wind of 2 m/s (7.2 km/hr) from the East. They knew they had a problem early on. In fact, Curiosity Deputy Project Scientist Ashwin Vasavada of NASA's Jet Propulsion Laboratory, Pasadena, California stated early on that "One possibility is that pebbles lofted during the landing hit the delicate circuit boards on one of the two REMS booms." He also said," We will have to be more clever about using the remaining wind sensor to get wind speed and direction." But they were neither clever enough to get the winds right at Gale Crater, nor honest enough to pull the erroneous daily reports until after we gave Guy Webster, their P.R. man, holy hell about it. During an argumentative phone call with Webster we reminded him that he was responsible because he was the man in charge of what got released to the public, and because he knew that what he was publishing under his name was wrong. He couldn't defend his position, and so, shortly after, as we demanded, he ensured that all wind reports for MSL were changed to Not Available. Ashima Research then did the same. See Figure 44 in our Basic Report. Figure 1 - After we called JPL and pointed out several problems with their Sol 370 pressure (highest ever claimed, proof that the sensor had pegged out, larger daily pressure change than ever seen before, and the spike was in the wrong season) they altered the pressure to 865 Pa (8.65 mbar) which was the same pressure that they published for sols 369 and 371. Figure 2 - Annual pressure variations reported for Viking 1, Viking 2, and MSL (a small data return by Phoenix is also noted). With regard to the absolute minimum pressure seen by landers on Mars, we now have 4 Martian years of data for the time around Ls 145 – one for Viking 1, two for Viking 2, and one for MSL. The data is summed up on Table 4. If we assume that the data was accurate, the average Ls was actually 149.8. (2) 4.777 mbar for MSL original pressure of 7.18 mbar. (3) 4.8572 mbar for MSL revised to 7.3 mbar (this seems to have changed again to 7.32 mbar). (4) 4.8080 mbar for Viking 2 Year 2 that indicated 7.29 mbar. (1) 4.777 mbar for MSL original pressure of 7.18 mbar. (2) 4.8572 mbar for MSL revised to 7.3 mbar (this seems to have changed again to 7.32 mbar). (3) 4.8626 mbar for Viking 1 that indicated 6.51 mbar. (4) 4.8735 mbar for Viking 2 Year 2 that indicated 7.29 mbar. Table 4: *Originally JPL published a pressure of 7.05 mbar for Sol 1 at Ls 150, and 7.18 mbar for Sol 9 at Ls 155, however they later changed these pressures to N/A. VL- 1 and VL-2 data from http://www-k12.atmos.washington.edu/k12/resources/mars_data-information/data.html. Table 5 shows some (not all) of how JPL/REMS altered off the curve data for August and September 2012 and August 2013 and on through at least April 4, 2018, after we either brought the deviations up to JPL Public Relations Director Guy Webster, or published on our davidaroffman.com and marscorrect.com websites.